InterContinental Hotels Group has long offered Friends & Family discount plan for its IHG Rewards Club members (encouraged by executives). 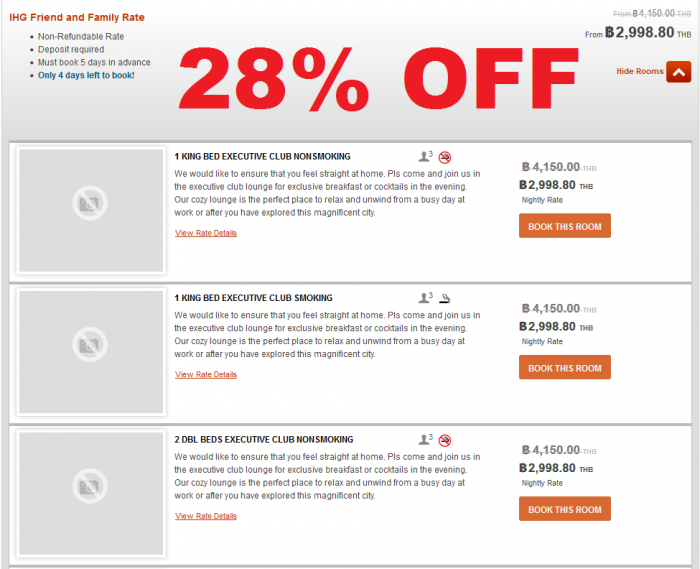 The Friends & Family discount varies from hotel to hotel and can be from from 6% to 32% off. 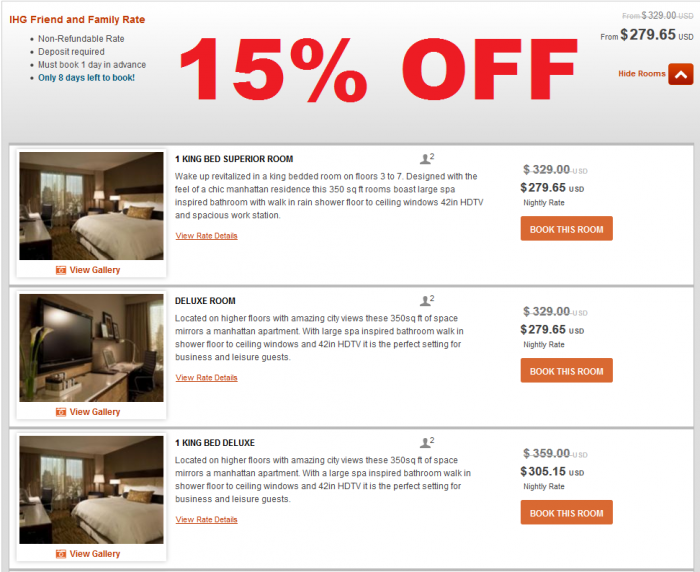 The web page states that the discount is 15% that is not correct. You can access IHG Friends & Family program website and booking engine here. Note that you may be asked to present the Friends & Family voucher that you can print out from the booking side and fill out the executive name mentioned. There is no need to use discount or corporate code to bring up these rates. Executing the hotels search on the Friends & Family website is enough. Note that Friends & Family rate is NOT eligible for stay/night credits and it won’t post as a qualifying stay. 5. Elite benefits offered (or not) are property dependent. Due to the issues above, I would ONLY use this rate if the saving is really significant. 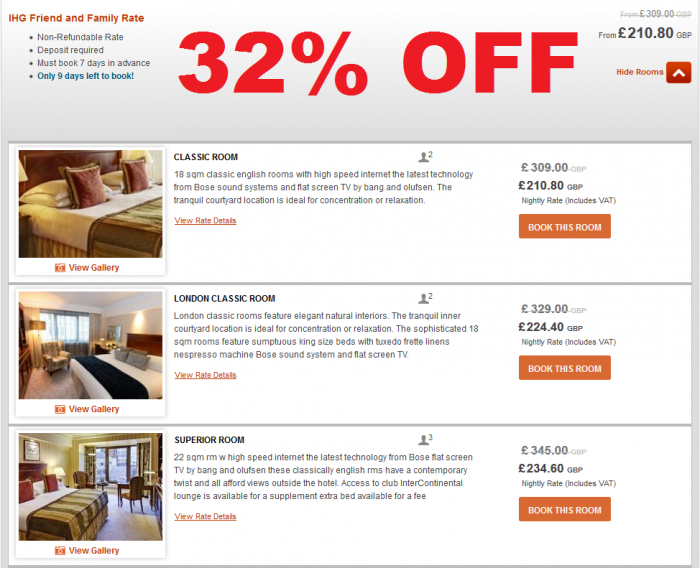 You should always check all the other available discount rates as well. There are no issues using this rate plan and the hotels won’t even ask the voucher most of the time. Make sure that you have one printed, however, just in case. I don’t usually use this Friends & Family rate plan because the stay is not a qualifying one. The Friends and Family Rate is available to Participants only. The Friends and Family Rate is available for room bookings only and not for packages or other components. Reservations must be booked on the Friends and Family Rate reservation website and must be made in advance of travel and are non-refundable, as determined by each hotel. The Friends and Family rates are subject to availability and may be changed without prior notice; do not qualify to earn IHG® Rewards Club points; may not be booked by travel agents; and are not commissionable. All room reservations are subject to each hotel’s standard room reservation and cancellation policies and procedures. All Friends and Family Rate bookings will be subject to applicable taxes, fees, and other standard service charges. The Friends and Family Rate for each hotel will be determined independently by each hotel and will vary with hotel locations/occupancy and blackout dates. The Friends and Family Rate may be terminated at any time without prior notice.